These a growing to be very healthy and beautiful flowers. I love them! They provide a beautiful delicate flowers with beautiful green leaves. Amazing in a natural area. This plants creates a stunning groundcover! Received healthy plants and they are truly amazing this year! I have been so happy with the order I placed for these. Blood Root plant produce a very red juice that is often used to dye clothes and has also been used by native Indians as war paint. This plant can also be used to stain furniture and other items. This plant is mostly used as a dye for yarn and cloth. This plant can be found growing deep in damp wooded areas. The plant can be named after their roots that when pulled or damaged release a blood-like sap from them. 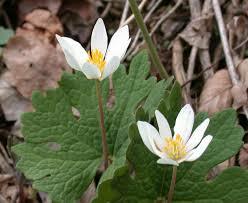 The Bloodroot blooms in the spring months with a few large white flowers. The Blooms look like a mix between the buttercup and the daisy. These blooms attract large amounts of bees and butterflies. This plant needs plenty of moist and rich woodland soils to live. Blood Root prefers to grow near water gardens under the shade of canopy trees. Blood Root Plant creates a beautiful ground cover for gardens and natural areas. It looks impressive and is unique. The seeds of this plant are scattered by ants that carry them to different locations. It is also a very fast growing plant and covers an area in no time at all. These are great for gardeners and homeowners that are wanting the plants to proliferate for them. They are very easy to grow and care. These also grow well when planted around shady areas around a lake or pond and help with soil erosion problems. Blood Root Plant produce beautiful white flowers that are made up of long slender petals and has a bright yellow center to them. The leaves are a dark color of green, so the flowers stand out when in bloom. They can sometimes be found growing wild in areas such as a forest where the soils are plentiful and always moist and shaded from the sunlight. Blood Root Plant can be found growing in the wild.